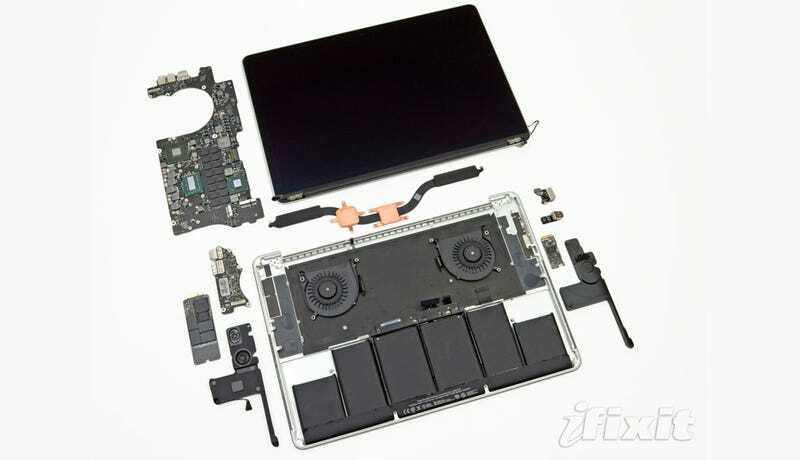 Above, you'll find Apple's gorgeous new MacBook Pro in all its retina display, big batteried glory, compliments of iFixIt. But look a little closer, and you'll find that Apple's made it virtually impossible to tinker with your brand new amazing. So, uh, let's hope it doesn't break. While iFixIt was rightly effusive in its praise of the retina MacBook Pro—all those pixels, that big ol' battery!—its team couldn't help but notice that Apple had gone out of its way to make sure its guts stay strictly within the confines of its unibody fortress. Want to open the bottom cover? Sorry, there are proprietary Pentalobe screws there with which iPhone 4/4S and MacBook Air owners might be familiar. Pick up some extra third-party RAM on the cheap? Not this time; that memory's soldered to the logic board. Oh, and don't even think about stuffing a bigger SSD in there on your own; it's proprietary, different even from he ones found in the MBA. And there's more! Remember that the display is part of the lid now, which means that you'll need to replace the whole thing if anything breaks there. And the battery is glued on, not screwed, which makes taking it out nearly impossible. Well, without breaking something, anyway. The lockup is so severe that iFixIt has granted the new retina MacBook Pro the title of "least repairable laptop" ever, at least that they've disassembled. And while the argument could be made that such strong security helps keep inexperienced people from breaking their pretty new machines, a stronger one is this: Apple would like your repair needs—and dollars—to go through the Apple Store. So hands off.